The DFG Excellence Cluster on Inflammation at Interfaces involves more than 200 researchers in genetics, biology, medicine and engineering who are investigating causes and treatment of inflammatory diseases by which millions of patients are affected in the developed world. Our group investigates the use wireless sensor networks as a tool for monitoring patients and animals, as well as how to apply bio-inspired self-organization techniques to make sensor networks more robust. In particular, we investigate the use of body sensor networks for fine-grained and long-term monitoring of body parameters in collaboration with the Institute for Psychiatry at the University of Lübeck. 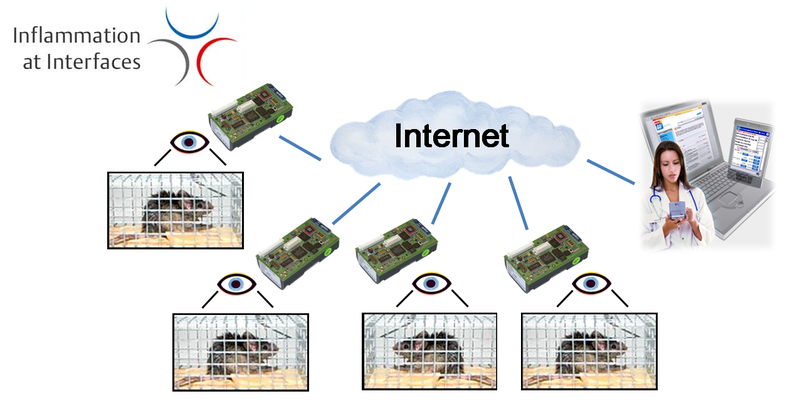 Further, we investigate the use of smart camera networks for phenotyping of laboratory mice in collaboration with the Institute for Dermatology at University of Lübeck.